It is a warm, relatively humid evening on the Northside of Williamsburg, unbeknowst to most, one of the last days of summer as a weekend of cold temperatures is about to arrive. I have rushed from a dinner at Moto with my best friend's sister, Lucy, who is in town for the evening, and still arrive 25 minutes late. It is my first glowlounge event, and I had simply assumed that things would start very punctually. Luckily, the event has yet to begin. I greet Christina, am introduced to Jonah, who hovers over his 12" G4 and proceed to sit down on the very sleek, modern boxes at the back of the bar that will serve as the bleachers for the talk. Jonah's desktop, including a truly inordinate amount of application icons on his dock at the bottom, is beamed on the bright wall. The bar is brand new, only open a few weeks, and not very crowded. But it is promising — cool and elegant, but with a little old-school flavor, exposed brick walls and a small "gallery" where beautiful sneakers reside artistically for the time being. There are questions as to when to start, but around 8:35 the action begins. There is a modest crowd of about 15 people, which is typical for the intimate setting of Glowlounge. Jonah is back in NYC, his old home when he studied at the Interactive Telecommunications Program at NYU, for ArtBots, The Robot Talent Show. He will be presenting a piece at the three-day festival in the Mink building in Harlem. Jonah originally moved to Ireland as a part of the European arm of the M.I.T. Media Lab, but after some misgivings about their almost exclusively utopian approach to technological progress, he proceeded to work more independently and currently is based in an engineering department (though very creative!) at Trinity Collge. 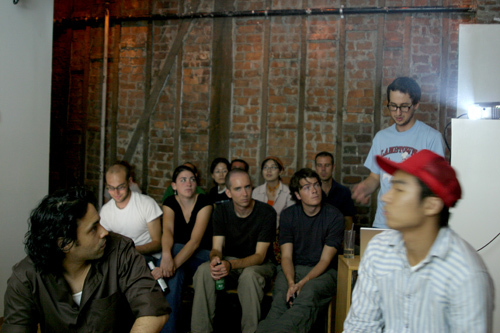 His main collaborator, Katherine Moriwaki had intended to also be present for the evening, but was unfortunately unable to make it due to illness. Jonah is particularly interested in network contexts, and examining the ways in which networks are taking over people in today's society. He draws a comparison to the Victorian age, when the telegraph first entered society and the impact of its introduction is not so dissimilar from the creation of the web in our age. Such current questions like security, privacy, proximity and immediacy we are all being confronted then as well. 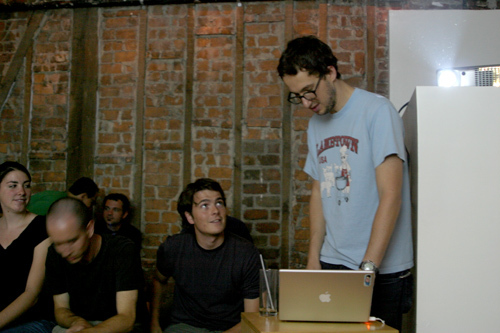 The first project Jonah describes is the "Internet Radio," which he completed in 2000. He replaced the traditional radio of an old radio transmission box with an Internet radio. The idea is so simple, yet so elegant and intriguing. It points to a thread through all of his work and the evening as a whole: creating visually striking installations and objects that draw attention to informational activity that is usually invisible to the eye. It is a subversion of context that through its subversion makes the viewer aware of the context itself. The next project he presents is under the banner of "Network Consequences." He asks the question: Adding physical consequences? It is another very simple, but powerful concept: a drill is hung within boring distance of a clean white wall at a Dublin arts center. Each time there is a hit on the center's website, the drill becomes active and bores slightly deeper into the wall. By alerting viewers to a less visible informational infrastructure, he piece asks: how does a website relate to the physical space it represents? Each visitor to the site is confronted with the message: you have contributed to 0.000057% of the destruction of the center's building. "Structural Manipulation" is the next category of investigation. 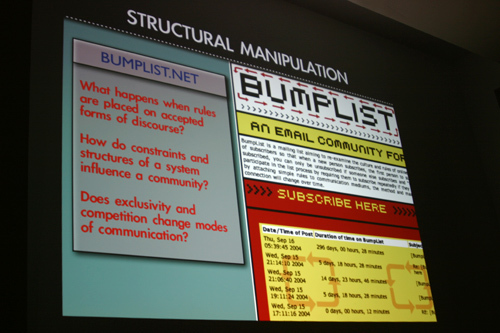 Jonah presents the project BumpList, an email community he created that is limited to only six members at a time. When a new person subscribes, then the last person of the six is bumped off the list. The project was motivated by the question what happens when a rule is imposed on the structure of a list. In this case, the impact was that all of the emphasis of the list became upon belonging. People would sign up vigorously to try to remain on the list as long as possible. Each user was ranked by how long they had been on the list in total. The response to the project was often quite comical. One person was so frustrated with being bumped off the list that he created a special yahoogroup for those who were bumped off the list. Other people trained their children to subsribe consistently to the list, so that they could maintain good standing while away from home. Brian asks the pertinent question: "Well, what is the discussion about?" Jonah says that lately it's been quite personal. People basically just talk about their lives, or, to a large degree about the list iteslf. It is a sort of chat email system because one might be bumped off before one has even finished writing a message. The number six was arbitray — it seemed small and exclusive. Policestate is the next project to be examined, falling under the rubric "Physical Displays." Carnivore is software developed by the FBI to snoop data (email, urls, Instant Messages, etc...) sent through ISPs. Despite the FBI's justification that using Carnivore advances the war on domestic and foreign terrorism, its use has unearthed many questions regarding its constitutionality. Infringements on personal privacy, free speech, Internet regulation, and the formulation of Echelon - a parsing agent for suspicious words - all bring Carnivore's existence into question. Jonah's project PoliceState was a means of bringing attention to the activity of the Carnivore software, creating a client that reverses the surveillance role of law enforcement into a subservient one for the data being gathered. The client consists of a fleet of 20 radio-controlled police vehicles that are all simultaneously controlled by data coming into the main client. The client looks for packet information relating to domestic US terrorism. Once found, the text is then assigned to an active police radio code, translated to its binary equivalent, and sent to the array of police cars as a movement sequence. In effect, the data being "snooped" by the authorities is the same data used to control the police vehicles. Thus the police become puppets of their own surveillance. This signifies a reversal of the control of information appropriated by police by using the same information to control them. Jonah's desired effect is achieved: to see data brought into physicality distinctly impacts one's perception of the data gathering process in general. How I have typed on the Internet since being introduced to this work has changed. Jonah showed very amusing video footage of the cars all moving together at Ars Electronica, and the piece can now be seen at the Parce de la Villette in Paris. UMBRELLA.net is one of Jonah and Katherine's latest projects and will be presented for the first time at the upcoming Spectropolis event. This project explores "Networks of Coincidence," the coincidental and collective experiences that connect people in urban places. 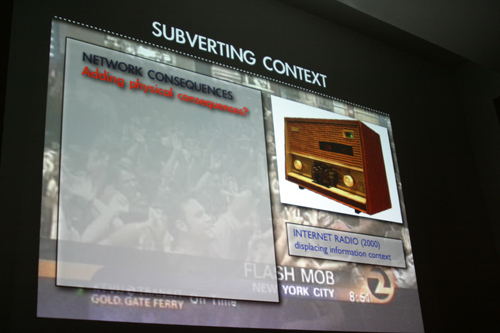 What are the social implications of ad-hoc networks? An example of an intriguing ad-hoc network is the group of people that in relative unison put up umbrellas while walking through a crowded square when it begins to rain. How can a visual footprint of a network exist in public space? The UMBRELLA.net system works with a hardware and software component that is integrated into the design of a typical umbrella. By embedding the system into an everyday object, our intent is to lessen the point of entry for people using the system as they are already familiar with the object and how it works. The prototype includes handheld PocketPC (iPaq) computers that will interface to the umbrella and only communicate with each other when the need exists: ie. When rain is present and other nodes exist in close proximity. 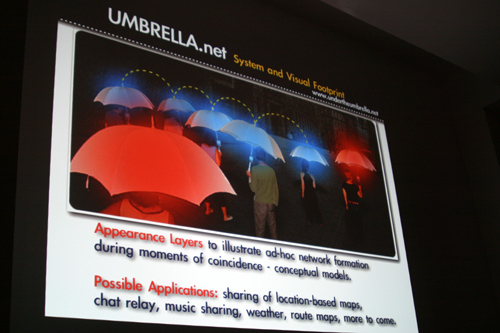 The current version of UMBRELLA.net includes 10 Bluetooth-equipped umbrellas each with an accompanying Personal Digital Assistant (PDA) that is running the networking software. When opened, the hardware on the umbrellas communicates to the PDAs to initiate a network connection. The umbrellas illuminate their states with bright LEDs. There are 3 states: 1) Pulsing red if searching for nodes, 2) Pulsing blue if connected to other umbrellas, 3) Flashing blue if transmitting data between umbrellas. These visual cues allow the general public to engage with the project. Those holding the umbrellas will be able to use the built-in chat program on the PDAs to communicate with other participants. There is also a visualization of the network displayed on the iPaq screens to show each person where they are in relation to others in the network and illustrate the multi-hop routing structure of the project. The final project to be presented is "Drawbots," the work that Jonah and Katherine will be showing at Artbots over the weekend. It is inpsired by the notion of "Simple Systems," motivated by simplification. What happens when a robot is broken down into component parts? What methods exists for hacking system structures? Using simple playstation motors, two plastic cups, batteries, and assorted scalvaged technological material (wires, etc.) robots that draw are created. Anybody can make an "Drawbot" and during Artbots Jonah and Katherine will hold workshops for people. The simple robot would be constructed with pens are attached to edge of the plastic cups. The little robot is then placed on a large table of construction and let loose. The spiraling markings of everybody's individual "Drawbot" come together to create a singular, collective artwork. The project allows people to create something of their own that they can also take away with them. Christina is curious if patterns emerge, and Jonah says that the patterns are dependent upon the design of the "Drawbot" itself and the materials that are being used. [Ed. note: Photos from Artbots can now be found on Jonah's site here]. Jonah also gives brief overview of some of Katherine's work which is largely concerned with the social fashioning of communication networks. Jonah shows some awesome pictures of fashion shows in Tallin where "magnetized suits" are put on display. Such an item of clothing invites the question: what would it mean to manufacture inconvenience back into our lives? Jonah also shows some pictures of Katherine's bags that monitor air quality and display it on the bag itself. Another project she has worked on is a "data diary" that allows people to swap information with people on the street. Brian asks about Jonah's thoughts on peer-to-peer network and the issue of central control. Jonah says he is trying to challenge how systems are set up in the first place, while also working within them to change their use, or change their way people think about them. Christina is curious if there was resistance at M.I.T. Media Lab to the questioning of utopic technology visions? Jonah said yes, to a degree. Largely it is connected to media representation, as well. The image that is good to be "always on." Brooke wonders if this representation is different in the USA and Europe? Initially, Jonah struggles to differentiate, saying that he experiences so much of both media worlds. But he feels that generally it is overhyped in the US. He cites the explosion of interest around social messaging systems that he says would never be adopted in Europe. Chris asks if the work Jonah is doing is the visualization of a tool to change people's perception or an end in itself? Is it a tool to teach people or what you would like to see happen? Jonah would like to see large physical displays of data activity happening. I leave the evening asking the simple question: What is it about knowing data that we find so fascinating and important? Unfortunately I cannot stay to socialize but must proceed to another gathering. I am grateful for having encountered Jonah's work in greater depth and look forward to the unveiling of the Umbrellas in a couple of weeks.